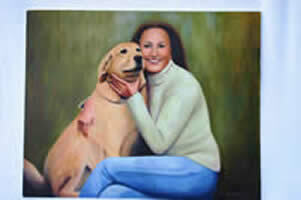 Local Kennesaw Artist, Donna Garrison Leonard, (http://www.everlastingportraits.com/) is a member of Mount Paran Church. On September 17, 2005 she attended Tara's funeral service and was moved so deeply in her heart, that she knew she was being led to contribute to Tara's memory. God must have impressed her to use her marvelous talents because nothing less could have allowed what was to follow. 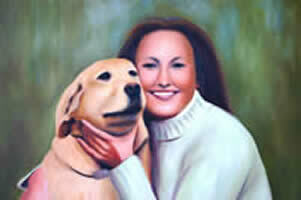 For several months at the end of 2005, Donna studied pictures and painted two oil paintings. One for the City of Kennesaw,,,,,,,,,,,,,,,,,,,,,,,,,,,,,,and,,,,,,,,,,,,,,,,,,,,,,,,,,,,,,,,,,,,,,,,,,,,,,,,,,,,,,,,,,,,,,,,,,,,one for the family. 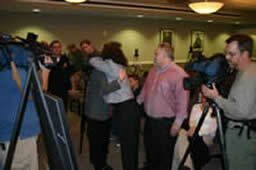 On Wednesday, January 11, 2006, the City of Kennesaw hosted a ceremony to unveil the paintings. 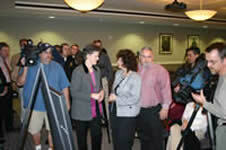 Multiple media representatives covered the event and many local dignitaries attended. 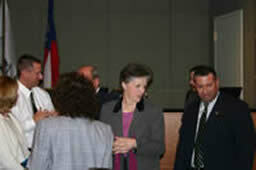 Kennesaw Police Chief Tim Callahan conducted the ceremony in excellent fashion. Family and friends were able to honor and commemorate Tara, along with Donna and the City of Kennesaw on this very special occasion. 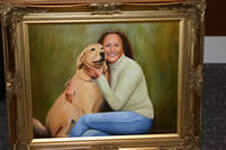 Even though Donna had never met Tara, she was able to envision her beauty and personality. The beautiful renditions created from simple photographs captured the smile and character of our precious Tara and of course, Daisy. 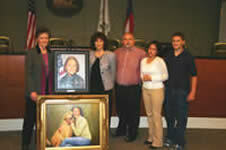 After unveiling the portraits at the ceremony, the Artist (Donna), the Family, and Kennesaw Assistant Police Chief Bill Westenberger hung the portrait in the entry foyer of the Kennesaw Police Department. 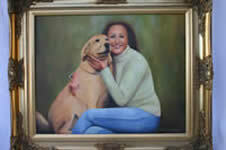 Each time someone enters the foyer, Tara will be remembered and honored. We are so thankful to Donna and her unselfish heart. May her life be richly blessed and may her talent shine everywhere. Go to "Contact Information" to contact Donna. Give her your support and tell her how much she is appreciated.